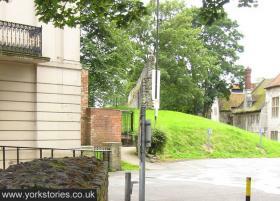 Following on from up the banks, here are some photos from around the other side. All can be enlarged. Partly for the benefit of the many regular visitors to this website who are now living many miles away (hello! to Paul in Canada) and maybe have had difficulty picturing the scene. 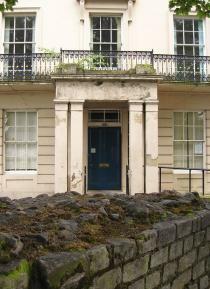 This is one end of the crescent of buildings, 1-9 St Leonard’s Place, which have been the main offices of City of York Council for many years. This is the end facing Exhibition Square. It has a small car parking area next to it. It’s a very handsome entrance, looking somewhat dilapidated at present, with weeds flourishing in its apparently crumbling stonework. In front of it is the bit of Roman wall which always has a nice display of bedding plants in front of it. A rather odd combination, I’ve always thought, but at least it draws the attention to the rather stranded Roman remnant. From a slightly wider angle, and moving a bit to the right, we can see the line of the old Roman wall continuing along behind St Leonard’s Place, between it and King’s Manor (which is visible on the right). Seeing it lined up like this makes it clearer what the walls were like, the line they used to take, before this part was demolished in order to create St Leonard’s Place. And moving in a bit, up there on the mound, the railings are visible to the left of the wall. I was standing just on the other side of them when I took the photos on Up the banks. There is quite a lot of space on this side, and it looks like there’s enough space to put in a nice wide wheelchair-friendly path, on a gentle slope, up to the top of that banked area, with those railings removed. 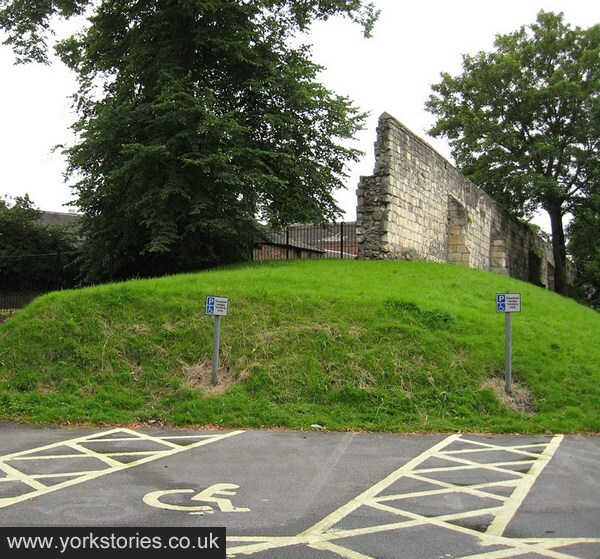 This strikes me as the most attractive and important aspect of any ‘opening up’, as the area immediately around the Anglian Tower appears to be inaccessible at present to anyone using a wheelchair. This is of course true of much of York, particularly the narrow wall walks accessed by steps. This part of our famous defences could however be made accessible, at least from a viewing point at the top of the banks? This may of course already be planned. Opening up the area has certainly been suggested, by Peter Goodchild, in a letter in response to the planning application relating to St Leonard’s Place. It may depend on whether the planned hotel would be willing to lose a bit of its car-parking area, which I imagine it wouldn’t. There’s also a fair bit of space in the lane next to King’s Manor, where it opens out. I don’t have a strong opinion, just hope there’s some way to make the Anglian Tower on the other side of those railings look less sad and forlorn. Had another quick look today. There’s been a problem with graffiti, there’s a dead squirrel on the banks, and the whole place stinks of pee.